K2 Vo2 S 100 X Pro women - the new 100mm women inline skate with one-sided frame technology VO2-S, ILQ 9 ball bearings, softboot and VO2 cuff. The new K2 Vo2 S 100 X Pro is the first 100mm Skate from K2 since 2011. This new K2 VO2-S 100 Women's Skate is no longer comparable to all previous models. The new single-sided rail technology VO2-S improves both the stability and the rolling behavior of the inline skate, as well as the damping by 15 - 20%. 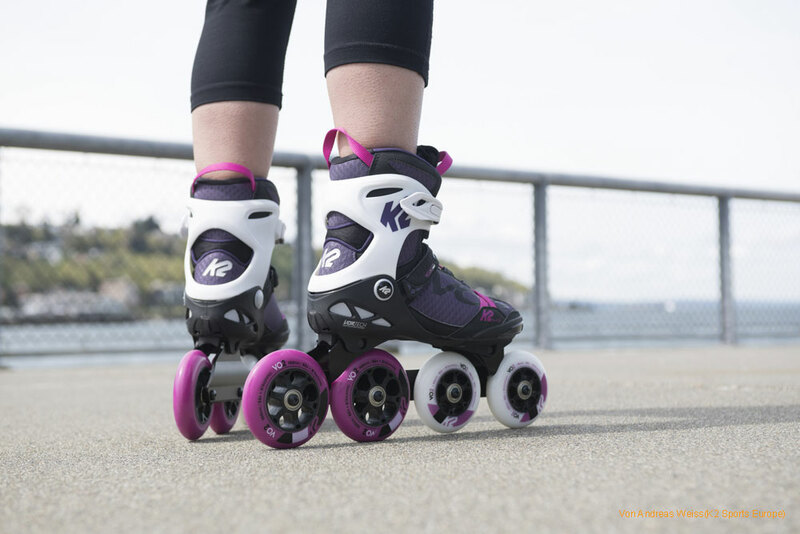 The K2 Vo2-S 100 skate for women was equipped with a Hi-Lo system with 2x 100mm rear and 2x 90 mm front wheels, 83a hardness and ILQ-9 Classic Plus bearings. The stabilizing cuff supports your foot in the ankle and heel area, the Vortech ventilation system guarantees perfect climate in the liner. The K2 quick lacing system ensures the easy and fast lacing of the skates.